Pankajakasthuri Herbals Breathe Eazy Granules can be shipped to Nederland [ NL ] & Worldwide . Pankajakasthuri Herbals Breathe Eazy Granules - Express Shipping Transit Time of is 5 to 9 working days from the shipping date. Pankajakasthuri Herbals Breathe Eazy Granules Product Usually ships within 2 to 4 working days from India. Respiratory diseases are not to be just cured, but up rooted completely. Diseases such as asthma, bronchitis, wheezing etc. take your daily life off the track and puts you at the mercy of inhalers and bronchodilators. Today, pollution has become an inevitable fact of life. Breathing problems, Asthma,Running Nose, Cold, Allergic Cough, Sneezing , etc. are more common now a days due to pollution. However,Pankajakasthuri offers you a sure remedy; Breathe Eazy, based on an age- old formula. By combining rare herbs and ingredients prescribed by the ancient ayurvedic texts. Breathing disorders occurs when the bronchioles in the lungs shrink ( Bronchospasm ) and there by makes breathing difficult , Breathe eazy works on the shrunken bronchioles, expanding them ( Bronchodialation ), clearing phlegm( expectoration ) and promoting uniform air passage in the lungs. It’s unique and time tested traditional yet Ayurvedic formula harnesses phyto nutrients and antioxidants like xanthones which helps building immunity, thereby improving the ability to breathe well. Breathe eazy offers long-lasting relief from respiratory ailments of all kinds. Rooted in the ancient science of Ayurveda, it is a unique product that makes life easy without having to carry inhalers around or abstain yourself from climbing stairs for the fear of losing breath. Its regular use builds immunity against asthma, allergic bronchitis, eosinophlia, sneezing and chronic – cough. Adult : 1 tablespoon ( 15 g ) twice daily ( after breakfast and dinner ). Pankajakasthuri, the name synonymous with the ancient system of medicine, believed and proved to be correct that hard work and dedication would culminate in making others wonder about its colossal achievements that too within a short span of time. The uniqueness of any individual or institution is appreciated on the basis of his or its capability to overcome fate. Pankajakasthuri offers only natural resources and ways of treating disorders and promoting health. It emphasizes prevention and empowers everyone to take responsibility for their own well being. This helped Pankajakasthuri achieve greater heights during the past 2 decades in Ayurveda. In fact it was dreamt of, envisaged and made a reality by a great visionary, Dr. J Hareendran Nair. His untiring efforts, dedication and commitment paved the way for its amazing and stupendous growth from a small makeshift research and development centre and clinic to one of KeralaÃ¢ largest corporate. Pankajakasthuri has established an overwhelming presence across the globe with a vast range of products and services in Ayurvedic sector. Pankajakasthuri has a well diversified product range and good number of institutions that too under the aegis of Dr. J Hareendran Nair. The company was established under the name and style of Ã¢â‚¬ËœPankajakasthuri Herbals India (P) Ltd. in 1988. It is KeralaÃ¢â‚¬â„¢s first ISO 9000 certified company in Ayurvedic medicine. It could make its presence globally and undertakes various projects in Manufacturing, Research and Development, Education, Healthcare, Health tourism etc. Pankajakasthuri Herbals India (P) Ltd. is vowed to explore the vast Indian flora to bring out life saving herbal preparations with no side effects and 100% efficiency. The dedication and enthusiasm shown by Dr Hareendran Nair and a battery of researchers have made themselves capable in curing diseases which other systems of medicines presumed incurable. The products are marketed by various divisions of the group. The over-the-counter division deals with 11 products, the FMCG division 9 products, Ethical division 13 products and the classical division more than 440 products. The flagship product of the company is Pankajakasthuri Granules for Asthma, which fetches 70% of the total revenue. After establishing itself in India, Pankajakasthuri has over a very short period succeeded in carving a niche for itself in the international markets with products being marketed in more than 15 countries. In all these countries product acceptance was spontaneous. 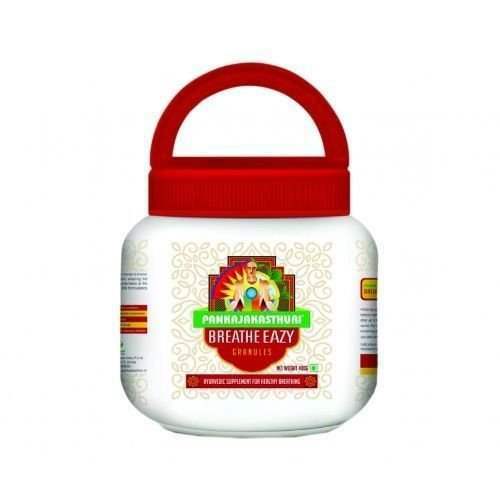 Pankajakasthuri Herbals Breathe Eazy Granules can be shipped to Nederland & Worldwide . IndianProducts.nl Ships Pankajakasthuri Herbals Breathe Eazy Granules Usually within 2 to 4 working days. In our e-commerce online stores we have listed the best selling products of top Indian brands at comparatively Low prices including Pankajakasthuri Herbals branded Pankajakasthuri Herbals Breathe Eazy Granules . Browse our online stores in this shopping cart to get the products / items at Competitive pricing. Shop Pankajakasthuri Herbals Breathe Eazy Granules for yourself, or order as a gift to your loved ones. Shipped to any place in Nederland ( NL)& Worldwide. Free and Express International shipping available. IndianProducts.nl is a pioneered online shopping store for Worldwide Customers and today it is the one of the fastest growing shopping destinations for customers on the Internet with thousands of quality branded Indian ayurvedic & Herbal products list including Pankajakasthuri Herbals branded Pankajakasthuri Herbals Breathe Eazy Granules . As ecommerce evolves, sellers and buyers in are increasingly sophisticated and adventurous, demanding more choice. IndianProducts.nl offers Consumers the widest range of products and branded stores, along with the product information and necessary date to navigate & order / buy Pankajakasthuri Herbals Breathe Eazy Granules efficiently online. We are committed to delivering the world's ultimate shopping experience with high quality of service to the People of World Wide. We ships to Victoria , New South Wales , South Australia ( AU ) , Western Australia , Tasmania , Queensland , Northern Territory and Australian Capital Territory Transit Time of Pankajakasthuri Herbals Breathe Eazy Granules Pack Product from India to Nederland ( NL ) & Worldwide is 5 to 9 working days. After receipt of your product Pankajakasthuri Herbals Breathe Eazy Granules order with completed payment. We will send an order acknowledgement email. Our Executives will purchase the Pankajakasthuri Herbals Breathe Eazy Granules from the Product Distributor / Authorised Stores / Retail Mall. After shipping your ordered product Pankajakasthuri Herbals Breathe Eazy Granules we will send you an Products Shipped Email.